Trimbak town is near Nasik,Maharshtra ,located at the source of the Godavari River and is the place of one of the twelve Jyotirlingas. The Jyotirlinga here is the form of a three faced, embodying Trimurthis, Brahma, Vishnu and Shiva. As per one legend, Vishnu and Brahma contested for superiority and asked Lord Shiva to be judge. Shiva appeared as a flame, and challenged them to find his feet and his head. Vishnu tok the form of a boar(Varaha), and tunneled through the earth to find the source of the fire and Brahma took the form of a swan, and flew to the sky to see the top of the flame. As neither Brahma nor Vishnu could find the origin and end of the fire,Vishnu gracefully accepted his defeat, but Brahma lied and said that he had found the crown of the fire. Knowing that Brhama was lying, Shiva cursed Brahma that he would never have temples on earth in his worship.On the request of Vishnu and Bramha, Siva who was in the form of a fire, took the form of a Shivalingam at the foot of the hill Brahmagiri, which is where the Trimbakeswarar Temple is located. Brahmagiri, a sacred hill from which three separate sources of the Godavari River emerge, flowing east is called Godavari, flowing south is Vaitarna, and the third is called the flowing towards west is Ganga, which meets the Godavari near Chakra Thirth. The river Ahilya also meets the Godavari in front of the Trimbakeshwar Temple. 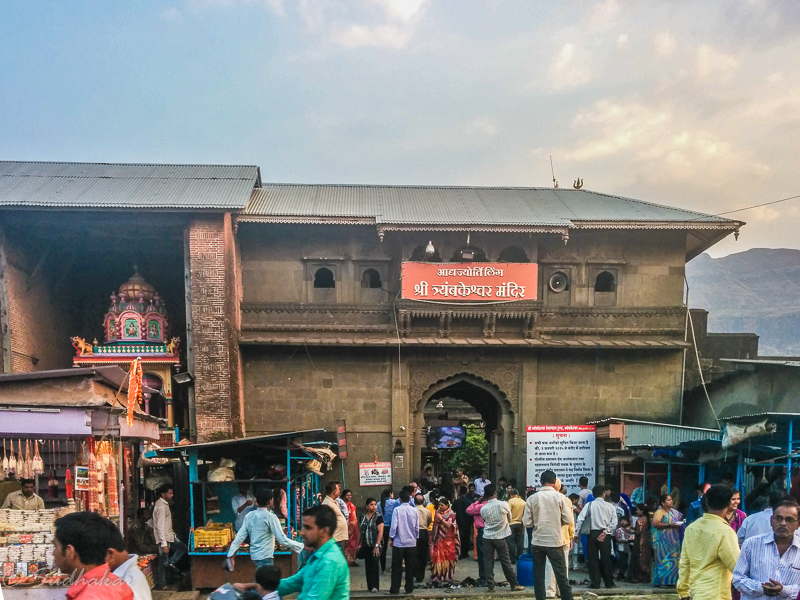 The present Trimbakeshwar temple was constructed during 18th century by third Peshwa Balaji Bajirao on the site of an old temple.It has a spacious praharam(courtyard) and is constructed with a black stone in the Nagara style. The garba graha (sanctum) is a few steps below the ground and on payment of certain fees we can enter and do abishekam with certain conditions.The Shiva Linga present inside the temple is called as Trimbaka denoting the three eyes of Lord Shiva. 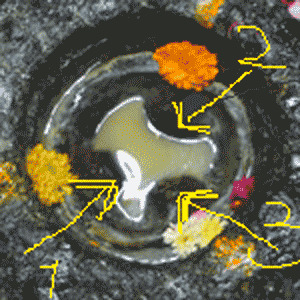 The three small (hardly 6 inches) sized Lingas represent Brahma, Vishnu and Shiva present in the 'Avudayaar' (pedestal where Siva Lingam is seen) at the floor level of the sanctum. The lingams are normally covered with a silver mask and , on festivals, a golden crown can be seen on the lingas. There are sannidhis for ganapathy, Gangadevi, Jaleswara, Rameswara, Gautameswara, Kedarnatha, Sri Rama, Krishna, Parasuraman and Lakshmi Narayanan. Kunds or Theerthams in Trimbekeshwar: Kushavarta Theerth is located west of Trimbakeshwar temple which is a few minutes walk. Kushavarta is the place from where the Godavari river takes its course.It is considered very sacred and holy a dip here in this sacred tank wipes off the sins. This holy pond is said to be the spot where Gautama Rishi finally secured theriver Ganga on earth by spreading the the darba grass around the river. This holy tank has flights of steps on all sides with pillared mandaps or prharams, and decorated arches. Every Mondays the silver mask of the Trimbakeswarar Lingam is brought here and given a holy bath. The Maha Rudrabhishek In this pooja the four Vedas, Rig, Sama, Yajur and Atharva are recited. Kaal Sarp Pooja This pooja is performed for those people who face difficulties in life due to certain positions of planets between Rahu and Ketu. Narayan Nagbali Pooja This pooja is performed to remove Pitru Dosham curses on the family. It is also done to seek the forgiveness of sarpa ( Cobra). This pooja is very popular here. Tripindi Shradha Pooja The purpose of this pooja is to calm down the pitrus. For removing dosha and hurdles in childbirth, marriage and other bad luck. Kumbh Mela - Held once in every 12 years,it is one of the largest religious gatherings in the world. Millions of pilgrims gather to take a dip in the Godavari. Mahashivaratri- Held in the February or March, devotees observe fasting and chant bhajans throughout the day and night. Tripuri Purnima- This festival takes place in the month of Karthikai (Nov- Dec). Rath Poornima- Held in January-February,the Panchamukhi Idol of Lord Trimbakeshwar is placed in a rath(chariot) and then taken around the town. 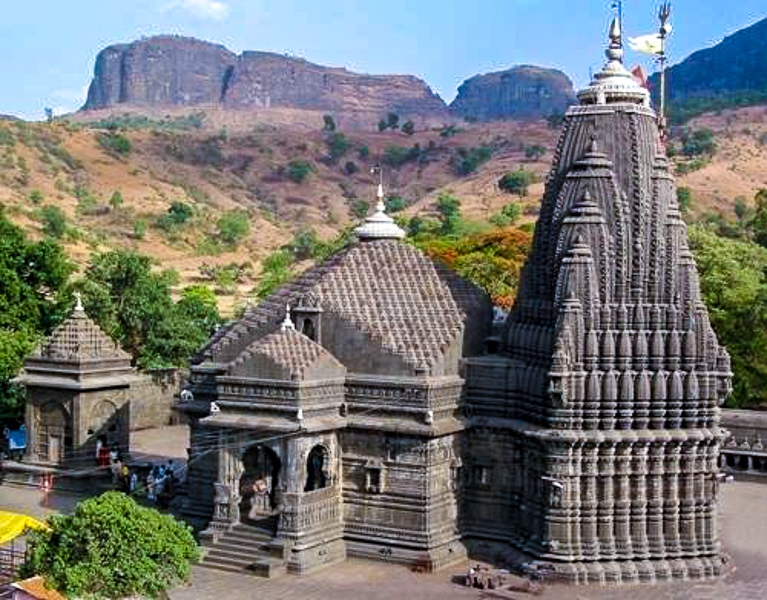 Temple location It is located 28 km from the city of Nasik and 40 km from Nasik road railway station. The nearest airport is Mumbai. The nearby railhead of Trimbakeshwar is in Nasik. 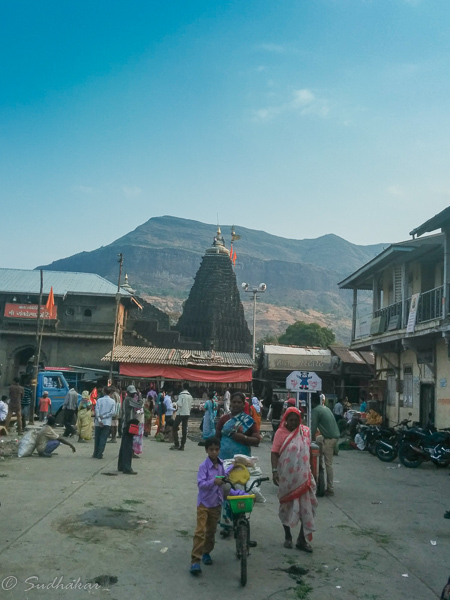 Trimbakeshwar is well connected by Maharashtra Road Transport Corporation and other private luxury buses. Where to Stay?There are many Ashrams, budget hotels in Trimbakeswar. During festival days and Kumbh mela, the place is very crowded and accomodation might be difficult unless you book in advance. Best Season: Throughout the year. Summer( from Aprto July) could be very sultry when the mercury shoots to 40 degree celsius. Altitude: 2300 ft above MSL.